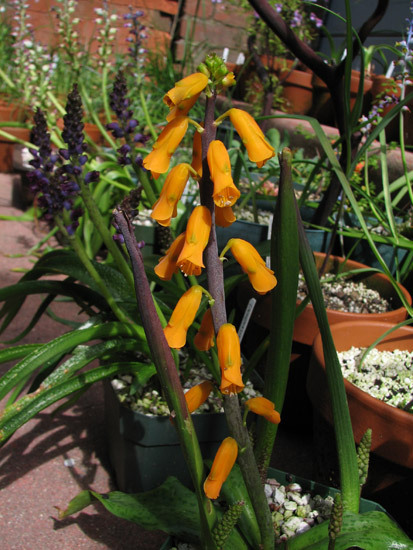 Lachenalia is a genus with bulbs in the Hyacinthaceae family found in Namibia and South Africa. There are around 133 species. 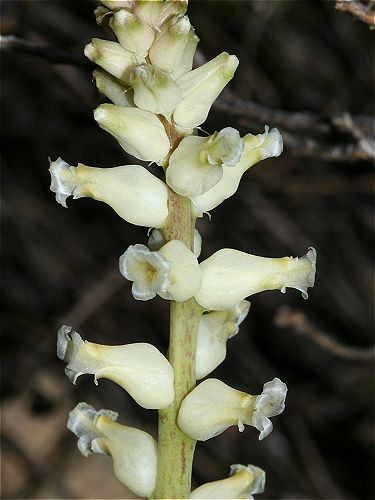 A complete illustrated systematic monograph of this genus by Graham Duncan, The Genus Lachenalia, was published in 2012. 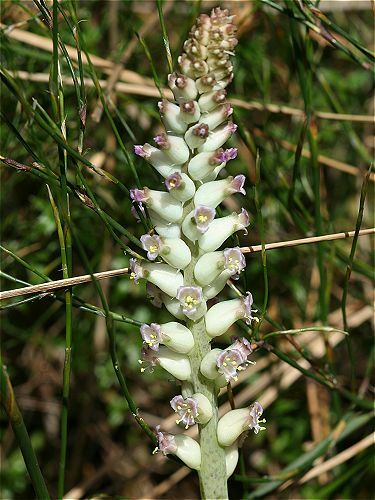 Lachenalia species D-I are found on this wiki page. 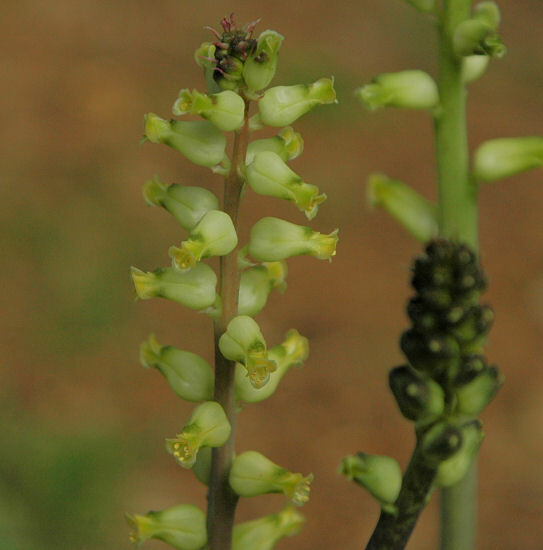 Lachenalia doleritica G.D.Duncan has two ovate leaves with recurved tips and bell shaped flowers that are yellowish green with darker tips. 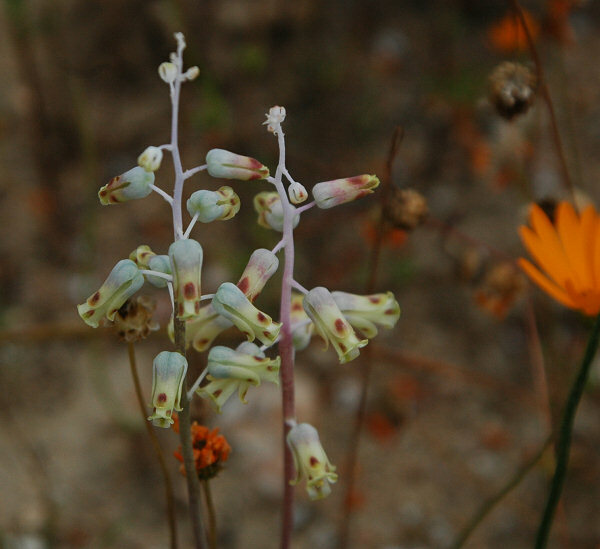 It grows on dolerite flats in the Roggeveld and flowers September to October. 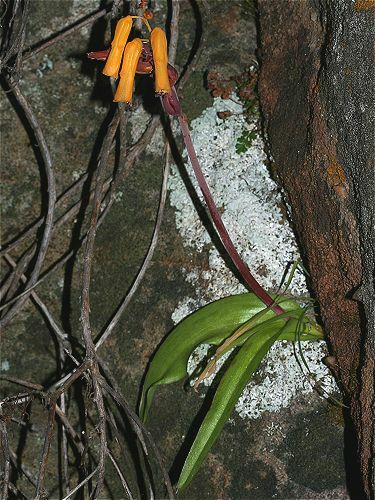 The first two photographs were taken by Mary Sue Ittner September 2006 early morning near Middelpos. The last photo was taken by Rod Saunders. 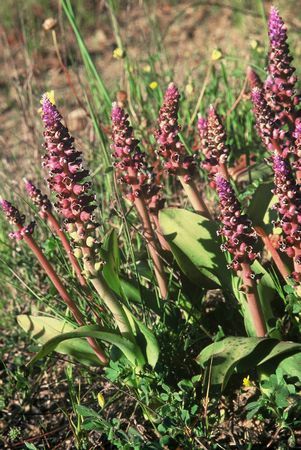 Lachenalia elegans W.F.Barker grows near Nieuwoudtville. 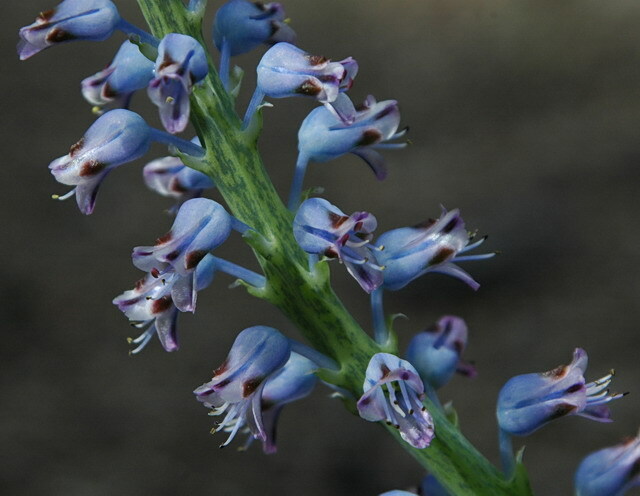 It has one or two lanceolate leaves and flowers that are blue at the base, shading to rose with brown gibbosities and white protruding inner segments with a pale pink spot near the tips. 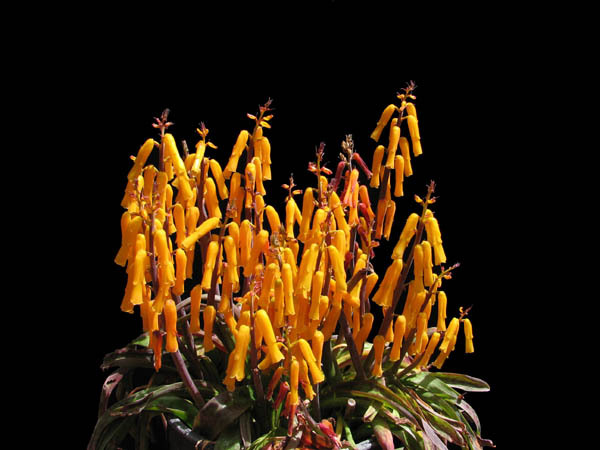 Many of the varieties broadly grown were elevated to species level in 2012 when Graham Duncan published his latest book on this genus. Photos below by Rod Saunders and Cameron McMaster could be what is left of this species. 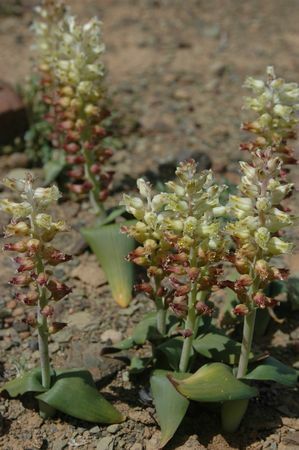 Lachenalia fistulosa Baker grows on rocky mountain slopes in the north and southwest Cape and blooms in spring. 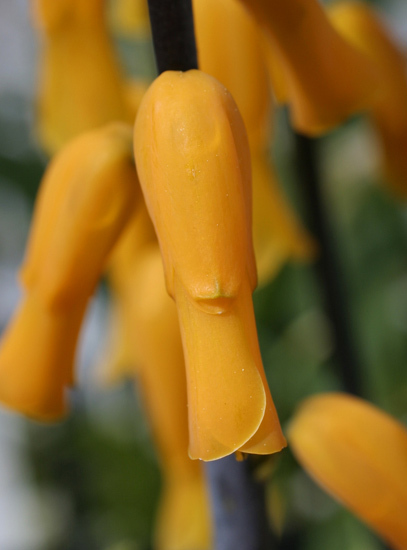 This species has two plain or spotted brown leaves and sessile cream, yellow, blue, lilac or violet scented bell shaped flowers. 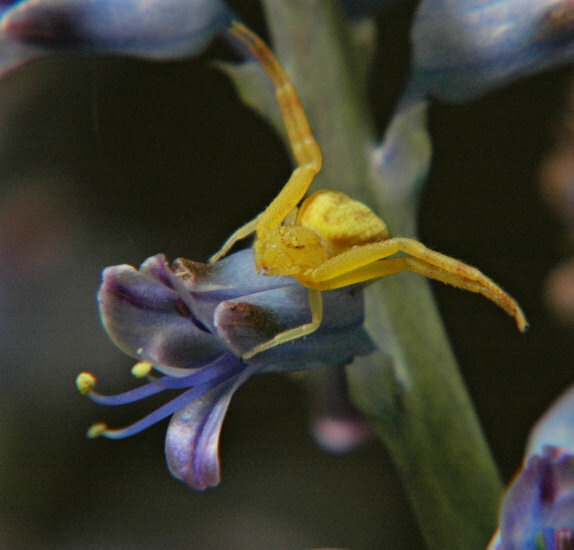 The first three photos were taken by Mary Sue Ittner of plants she has grown from seed. The last three pictures from Andrew Harvie were taken in habitat at Silvermine and Lion's Head in Table Mountain National Park. 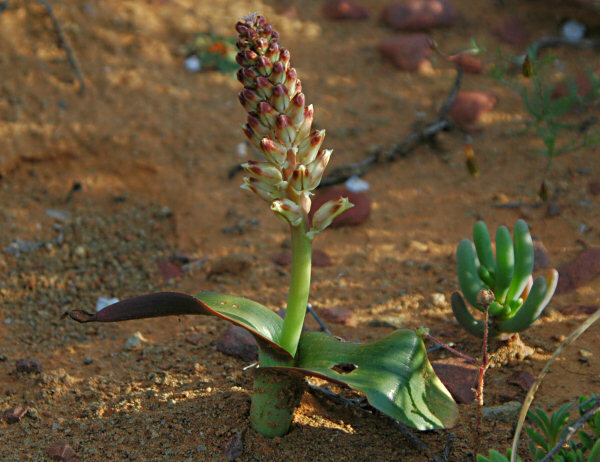 Lachenalia flava Andrews has been known by many different names. 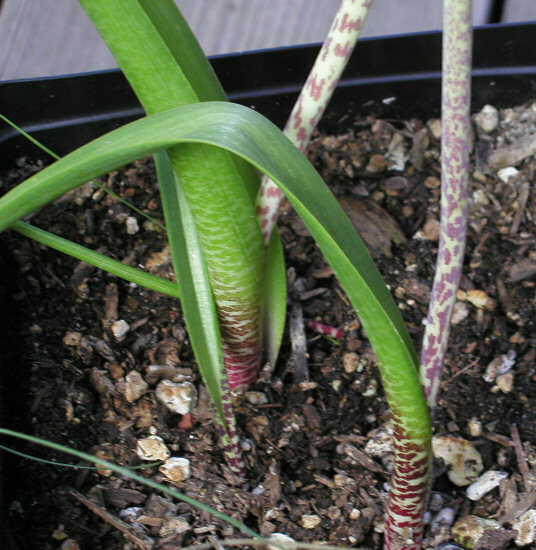 Synonyms are Lachenalia aloides var. aurea (Lindl.) 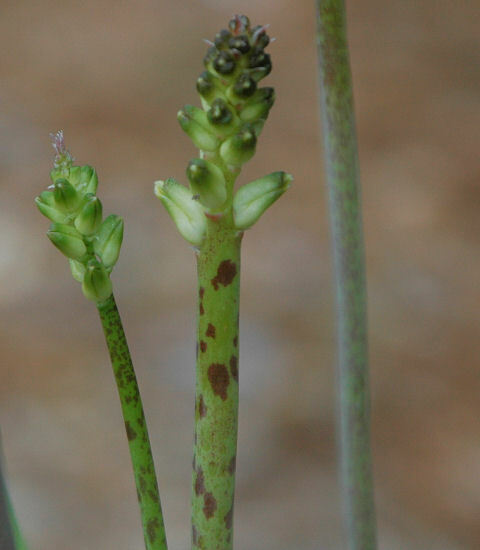 Engl., Lachenalia aurea Lindl., Lachenalia macrophylla Lem., Lachenalia quadricolor var. 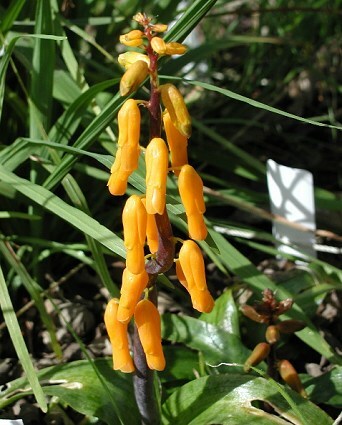 lutea Sims, and Lachenalia tricolor var. aurea (Lindl.) Hook.f. 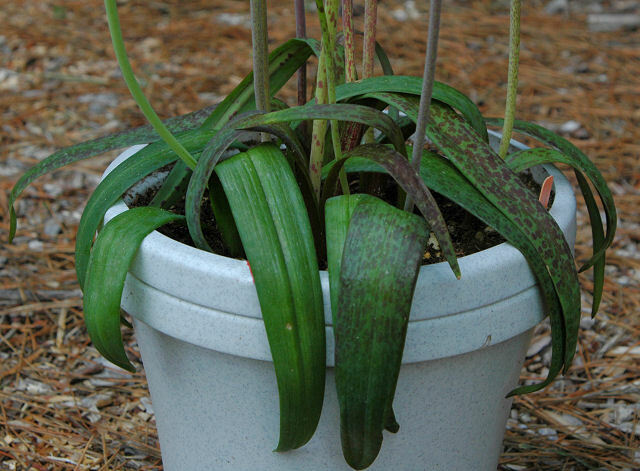 Plants have two leaves that can be plain or spotted and golden-yellow long lasting flowers. Photo 1 was taken by Jana Ulmer. Photos 2-3 by Mary Sue Ittner show the flowers and the leaves of plants grown from wild seed collected near Paarl. Photos 4-6 were taken by Nhu Nguyen. 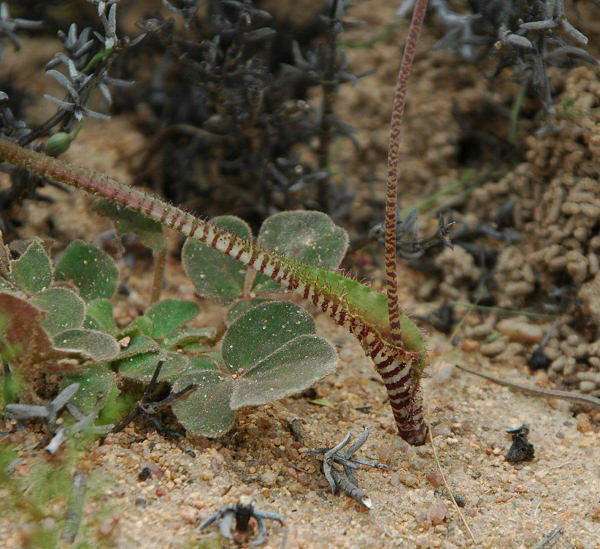 Photo 4 shows a form with green tepal tips. Photo 5 shows a closeup of another form. Photo 6 shows a dramatic display of orange! The photo below was taken in habitat near Bainskloof by Andrew Harvie. 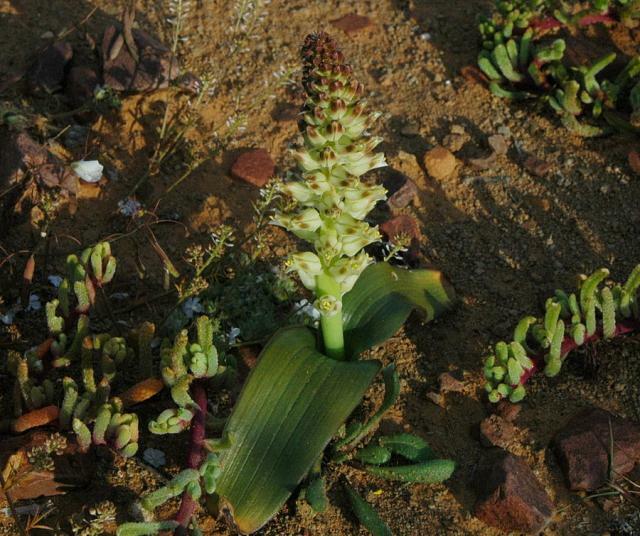 Lachenalia framesii W. F. Barker is a Namaqualand species that grows in flat sandy areas, often in large colonies. 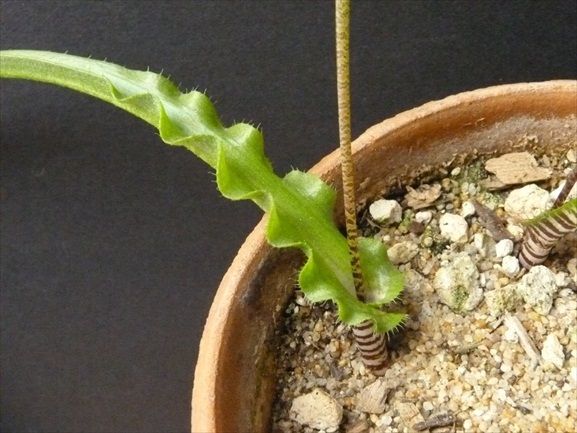 This is a delightful small species with a quite striking inflorescence consisting of greenish yellow outer perianth segments and protruding inner segments that have recurved magenta tips. It flowers in the period between the third week in August and the second week in October. Description from Don Journet. The first two photos from Alan Horstmann. The last was taken near Knersvlakte September 2011 by Cameron McMaster. 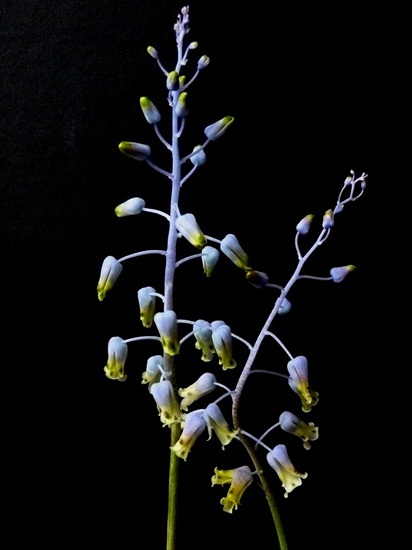 Lachenalia gillettii W.F.Barker was proposed to be included in Lachenalia pallida Aiton in Graham Duncan's 2012 book. 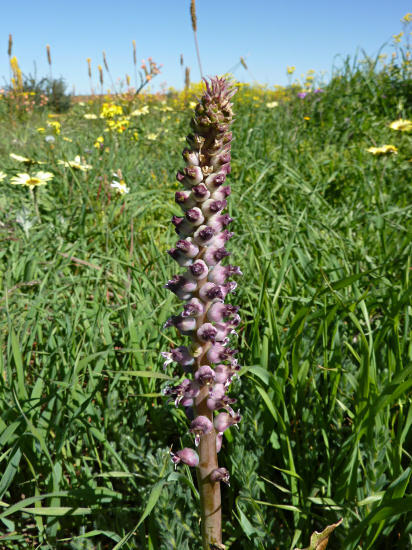 It is found in clay soils in the northwest Cape near Piketberg and Citrusdal. 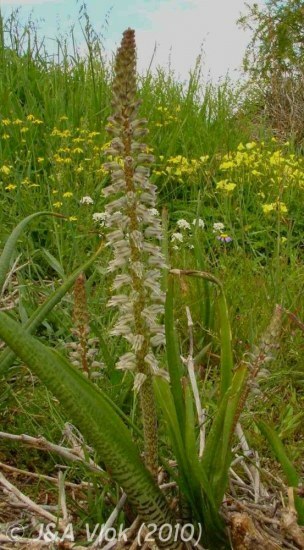 Growing fro 12 to 22 cm high, it has two strap shaped leaves and shortly pedicellate, narrowly bell-shaped, white and lilac flowers with green markings. The anthers are exserted. The inner segments have magenta tips. Flowerig is from August to September. Photos by Mary Sue Ittner of plants received grown from seed that are supposed to be this species. 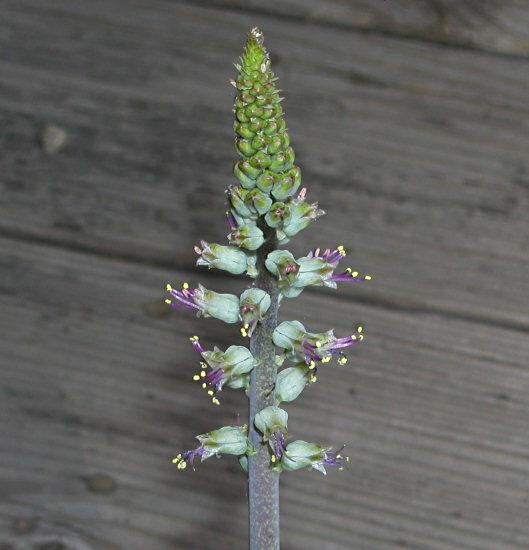 The colors are different so I suppose it could be something else, perhaps Lachenalia unicolor. 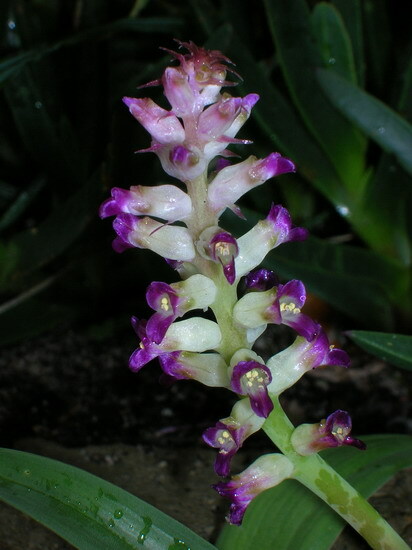 Lachenalia haarlemensis Fourc. grows on stony clay slopes in the southeast Cape. 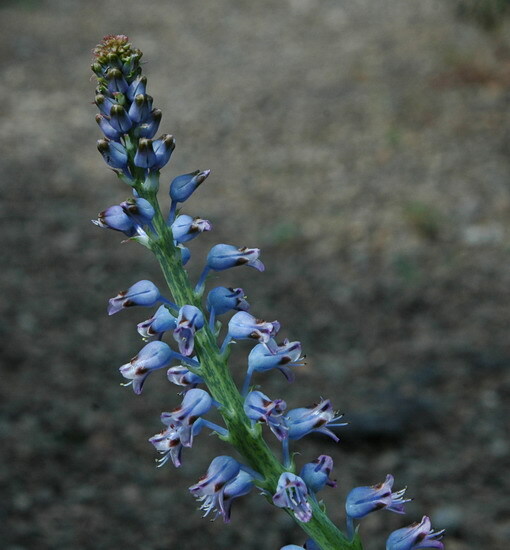 It has one or two leaves banded with maroon and greenish gray bell shaped flowers that are shortly pedicellate with exserted mauve flowers. Flowering is September to October. The first two photos from Mary Sue Ittner. 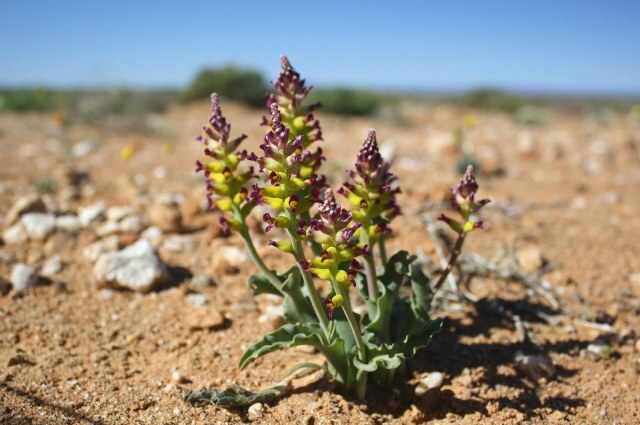 The last photo from the book Plants of the Klein Karoo courtesy of Jan and Anne Lise Schutte-Vlok. 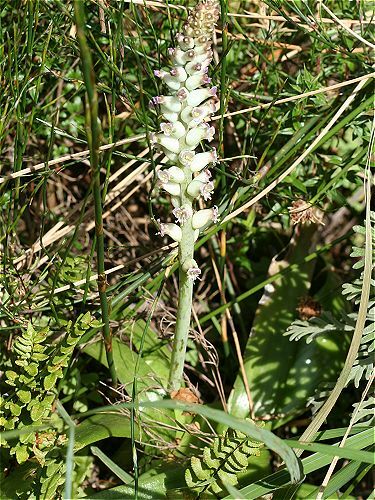 Lachenalia hirta (Thunb.) Thunb. 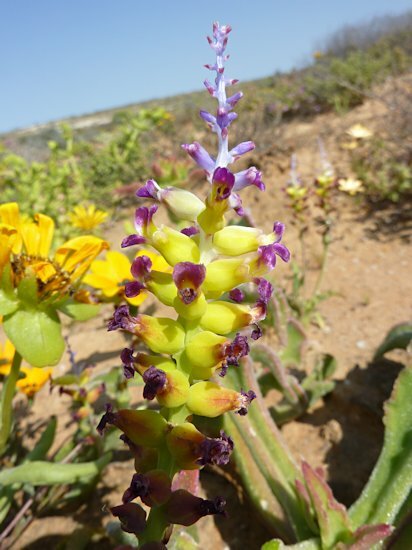 is distributed from Namaqualand to the Western Cape where is grows in sandy soil, often in large colonies. Generally the flowers do not make this species stand out in a collection as the colours are not vivid but it is non the less quite charming. The flowers have outer perianth segments that are pale blue at their base shading to yellow with brown gibbosities. The single narrow leaf of this species is striking in the strong purple horizontal banding towards the base and the hairs on the margins and reverse of the side (hence the name hirta). Description from Don Journet. Photos taken by Mary Sue Ittner September 2006 in Namaqualand show the flowers and the unusual leaf. 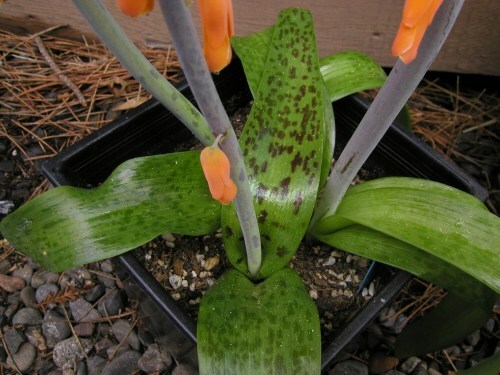 Photos 3 and 4 by Colin Davis show striking floral coloration (true colors) and leaf undulation. 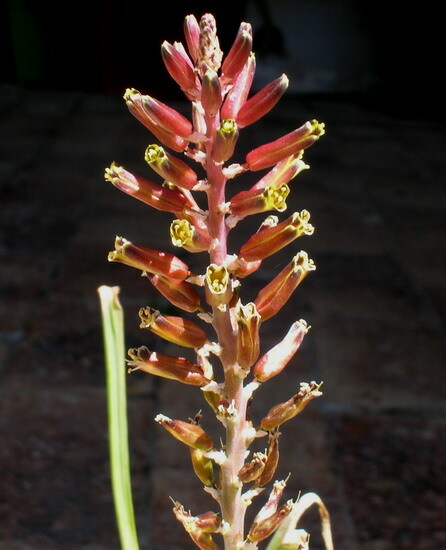 Lachenalia isopetala Jacq. is found on dolerite flats in the northwest Cape and the Roggeveld. 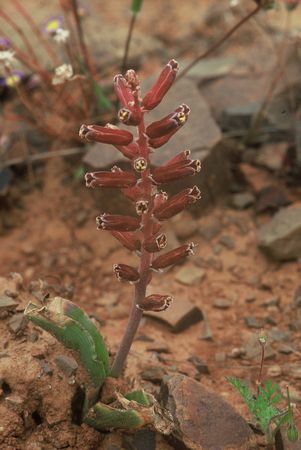 Growing from 10 to 30 cm high, the species has two lanceolate leaves, often dry at flowering and shortly pedicelate brown to maroon flowers. 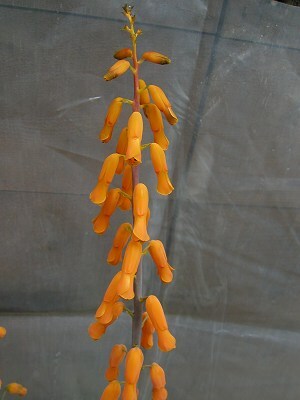 Flowering is October to November. Photos by Alan Horstmann and Rod Saunders.